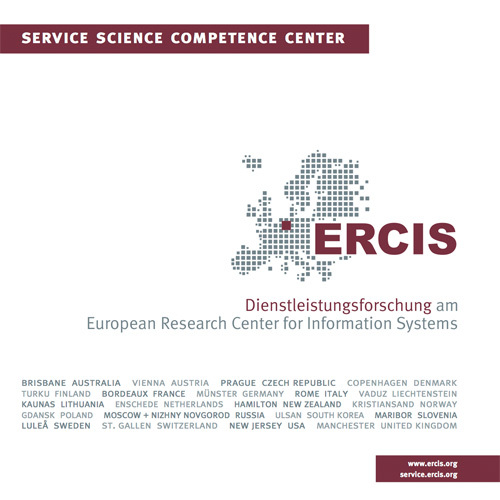 CAISE 2017 | ERCIS Competence Center "Service Science"
Public and private organizations are entering into the digital world where real time data is available about their operations and operating environments, third-party services offered to increase their performance, and changes in the demands of their customers. Such abundance of data offers new opportunities but also raises new challenges for information systems. The systems have to exploit these data to help (networked-) organizations to decide and conduct appropriate business transformations that are necessary to guarantee their survival in an ever changing world. The digitalization of the world, the availability of data in real-time and the increasing connections of things, IT-systems, and organizations have significantly increased the role of information systems in the organizations during the last decades. Historically, enabled by databases and file systems technologies supporting data storage and retrieval facilities, information systems have proven instrumental in supporting management issues associated with the optimization and partial automation of processes and document flows in more efficient organizations. With the internet and web technologies, enhancing the quality of the information, information systems are increasingly regarded as a centre of profit rather than a centre of costs. The transformation of data into information intensive services creating new customer/client value has led organizations to reshape their business value proposition. Architecture of information systems has evolved to enable increasingly interconnected service systems. Prof. Becker contributed as a member of the Programm Committee of the conference.